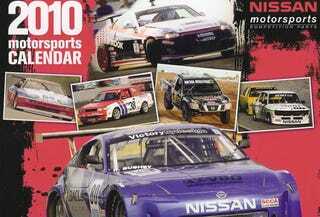 If you walk into the parts department of your local Nissan dealership you might see a calendar hanging on the wall. For the month of November the car displayed is a prior Jalopnik-featured car. A couple of Jalopnik alums did some posts "back in the day" on this little Nissan SE-R (article by Jonny Lieberman / article by Murilee Martin) prior to moving on to greener pastures and cleaner garages. Thanks to the attention of those two gentleman and this site this car has lived quite the paparazzi life being featured in both Grassroots Motorsports and Nissan Sport magazines. The red 38 car's little brother, the blue 33 car, is the one the team will be running in the National Auto Sport Association (NASA) 25 Hours of Thunderhill December 4-5, 2010. We will bring you live coverage of the race here on Jalopnik next weekend. To see how the Nissan team is preparing for the event check out the pre-race story on Speed:Sport:Life.